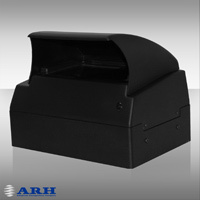 The MULTI Reader is the all-in-one solution for ePassport reading and checking. The goal of the development was to fulfil all the requirements that ever arise in the document reading technology from complex immigration tasks to simply data acquiring. Contrary to other similar purpose designed readers (which are using separate devices to read optically the MRZ respectively the RFID chip OR some 'all-in-one' devices but which are able to read the data just in case the printed MRZ and the RFID inlay are in the same page) the antenna of the Multi Reader cover the full passport, does not matter where (in which cover) is placed the RFID inlay. Using this architecture, the Multi Reader is able to read (optical) the MRZ lines printed in the ePassport and the content of the RFID chip in the same time. That's why is called as well "one step reader"